Dogs that have allergies show many signs including watery eyes, coughing and sneezing, excessive scratching and biting, vomiting, diarrhea, fatigue, and moodiness. When your dog is suffering from allergies, you may notice one or more of these symptoms. Learning what causes these allergies is the first step toward treating your dog and preventing further attacks. Many allergies that dogs suffer from are caused by insects such as fleas and ticks, or by parasites. When you bring your dog home from a breeder or from a shelter or pet store, schedule an appointment with a vet as soon as possible. Make sure the dog has all of its shots and that is has been dewormed. This will prevent parasites from causing an allergic reaction in your dog. While you may have to do this more than once during their lifetime, getting rid of the parasites will help your dog’s temperament and keep them healthy. 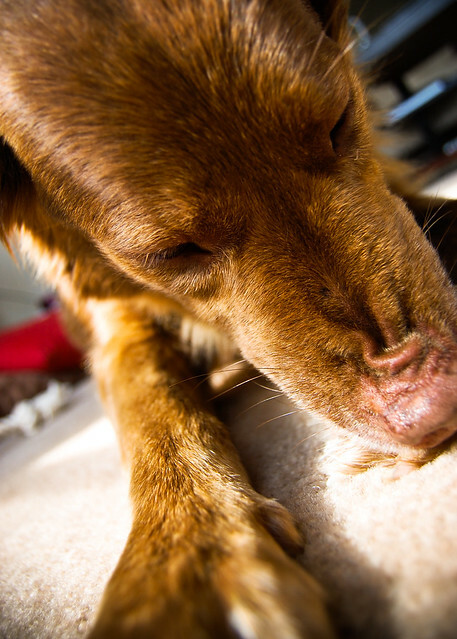 If you noticed small red bites on your dog or if the dog has been scratching the same area until bald spots appear, then they may have fleas, ticks, or mites. This allergic reaction is caused by insect saliva. If your dog has open wounds, you should wait until the wounds heal before spraying or bathing them with medicine that kills the insects and their eggs. Take your dog to the vet if this is the first occurrence. The vet may be able to prescribe an ingestible pill that will protect them from future infestation. You may also want to keep your dog indoors during flea and tick season. When your dog vomits more than once a week or has diarrhea for more than one or two days, they may have an allergy to dog food. Switching to another brand or feeding the dog softer food may solve this problem. You should take the dog to the vet anyway so that they can make sure the dog is healthy. Extreme diarrhea will lead to dehydration, so make sure you have plenty of water for your dog to drink. If your dog’s mood changes suddenly or you notice that they are not as playful as they once were, then you should take the dog to the vet. If the dog has eaten something it shouldn’t or if it is suffering from allergies, it will not want to play as much as it used to. Finding out the cause of their allergy may be difficult because, much like human beings, your dog may be allergic to more than one thing. Research your dog’s breed to see if there are specific items it could be allergic to and see if they are present in your home. Monitor your dog to see how it behaves and what it is eating. Sometimes eating too much grass can cause an allergy attack. Once you find the causes of the allergy, take the steps necessary to reduce the dog’s exposure what is causing the allergy as much as possible. Everyone seems on edge about the latest outbreak of avian flu. People in China are told to kill their poultry in order to keep the virus from spreading. Meanwhile, people in the United States watch on in fear that the avian flu will come to their shores. So what exactly is all the hubbub about? After all, every winter millions of people come down with bird flu. Influenza, the term, came into use around 1504, though it had little to do with the virus. It came from the word: influence. At the time, influence meant: “the ethereal power of the stars acting on men.” It was basically a supernatural way of explaining the effects of disease on people at the time. During a particularly nasty outbreak of the flu in Europe during 1743, the term was officially attached to the name of the disease. 96 years later, the term was shortened to just: flu. The flu, itself, is a whole family of viruses called Orthomyxovirids. They are a diverse family that is commonly found in the guts of birds. The specific type of viruses that infect birds are called type A flu. It was one of these type A’s that was believed to have infected people a long time ago. Thus giving us, the flu for the first time. Though the virus that initially infected man, has long since evolved into a variety of human-specific strains, the initial origin appears to lay squarely among birds. As such, all human flu bugs could, technically, be called: avian flu. Pathogens are viewed as being any living organism that is capable of causing a disease. It is a term that is generally reserved for bacteria, fungi and viruses. Pathogens are usually very specific in who, or what, they infect. This has a lot to do with the way in which they are constructed. Both bacterial and viral outer structure, consist of a receptor binding proteins. These proteins give the pathogen a certain geometry. This geometry allows the pathogen to attach to complementary receptor sites on the cells of the critter that they are trying to infect. Because of the wide variety of life forms on the planet, each cell type has a different arrangement of receptors. Most of the time, the pathogen’s geometry will not fit these receptors, and the critter remains immune. Only those unlucky few species, whose cell receptors do fit, are the ones that have to suffer the infection. Occasionally, though, a new pathogen comes along that has a geometry that is general enough to allow it to latch onto many different species. These are the pathogens that are often the more deadly. Influenza is one of these general viruses. It is capable of infecting most bird species. It’s also very good at doing what all life forms do. It evolves. This has allowed it to cross multiple species barriers, and jump from birds to people, to pigs, cows, and horses. Thus making influenza a very cosmopolitan virus family. This still doesn’t explain all the worry about this recent outbreak of avian flu though. For that, one must go back in time to 1918, and the Spanish flu. It was the close of World War I, and the world appeared to be returning back to a more peaceful state. Then, in various parts of the globe, people started coming down with a particularly virulent form of the flu. This was a unique case though. Instead of the very young, and elderly dying, it was affecting young men and women instead. Usually, these are the most immune to the effects of the flu. By the end of 1918, this form of the flu had killed ~50 million people. It was the largest pandemic (worldwide epidemic) in recorded history. So what happened? Normally when one gets the flu, it is more of a hassle than anything else. This has a lot to do with the fact that the flu types we normally catch, are viruses that have infected us before. They have changed just enough so that they can infect us again, but they still remain recognizable to our immune system. As such, our bodies can keep the virus in check, and then eventually eliminate it. The 1918 flu, though, was different. It is now largely believed to have been a case where a new flu virus had hopped species. It went from birds to humans, possibly after circulating and hybridizing inside pigs (which can catch both bird and human versions of the flu). This new bug was completely alien to our immune systems and thus, took many completely by surprise. This is what has many scared about this newest avian flu virus (dubbed: H5N1, for the specific proteins found on it). It has proven to be particularly virulent among birds, and the few cases of it infecting people have many worried that another pandemic is on the rise. Influenza is a type of disease referred to a zoonosis. It means that it can be transmitted from one animal group to another. Zoonotic diseases used to be further broken up into those that humans catch from other animals (anthropozoonoses) and ones that other animals catch from humans (zooanthroponoses). Unfortunately, both terms have been misused and confused so much, that neither is particularly favored anymore. Now they are all viewed as zoonotic diseases. In the end, this makes the most sense, as human beings are animals anyway. To break things up any further just seems excessive. The flu is not the only zoonotic disease that humans get from other animals. Our primate cousins have given us quite a few different diseases including malaria, hepatitis B, Dengue fever and lymphoma. Of course the most infamous of these zoonotic diseases would probably be HIV. Though there are those that would like to believe that the Human Immunodeficiency Virus was a genetically engineered weapon that was released among the African populace (they give far too much credit to genetic engineers, who are proud enough to make yeast that can fluoresce), the simian origin of HIV is pretty well established. HIV has close ties to the simian version: SIV (Simian Immunodeficiency Virus). The big difference between the two, besides their first letters, is that SIV rarely kills the apes it infects. In fact, many apes are capable of carrying viral loads equivalent to those seen in humans with advanced AIDS, yet rarely show any signs of trouble. This suggests that the host and the pathogen have been doing this for a very long time, and the host’s body has found a way to handle the virus. Humans only recently acquired HIV. As such, our bodies have yet to “learn” how to deal with the threat that this virus poses. Which is one reason why HIV is so very virulent at the moment? These are just some of the diseases that other animals have given to humans. But what of the reverse? What have we given our animal brethren? Many of the “classic” diseases that most humans catch are ones that we are capable of giving to our primate cousins. This includes the flu, measles, chicken pox and tuberculosis. One particularly nasty disease that we are capable of transmitting is the infamous Foot and Mouth Disease (FMD). FMD rarely affects humans, but it does use us as a carrier for it. The disease can hang out in our nasal passages, throat, and on our clothing. It usually infects various forms of livestock (cattle, pigs, sheep, goats). Symptoms usually include fever and prominent sores on the feet and mouth (hence the name). Most infected animals to survive. Only ~5% die from the disease. The second disease is far more pernicious, and the victims have us to blame. It is the coral disease referred to as: white pox. This disease can kill up to 10 square centimeters of coral a day (~120ft a year). Over the past decade over 90% of Caribbean reef coral (Acropora palmata), has died. The culprit behind it is the little human gut bacterium: Serratia marcescens. While humans can occasionally fall victim to this bacterium, it usually doesn’t infect us. Instead, it lives in our guts and gets expelled in our feces. Improper sewage treatment has resulted in human excrement flowing out into the Caribbean, where the newly released bacterium has infected the local coral. So remember; the next time you start to feel under the weather, don’t worry about coughing on your dog. Chances are, your canine pal probably won’t get it. Unless, of course, it is the flu. A traditional medical cone is worn by canines after surgery is performed to protect the wounds from scratches and irritation. The most common include the Elizabethan or E collar that consists of a hard plastic cone to fit around the neck of a pooch and restrict the ability to reach target sites. Cones for dogs are available in different sizes and styles that should be chosen according to the needs of your pet. The modern cones that are available for dogs can be worn to protect the surgical site and to ensure that the canine does not succumb to infection or additional damages. A dog is recognized as constantly licking at the wound that may cause a severe disruption to the regular healing process. Canines may bite at the injury and loosen the stitches that can lead to additional operative needs and complications. 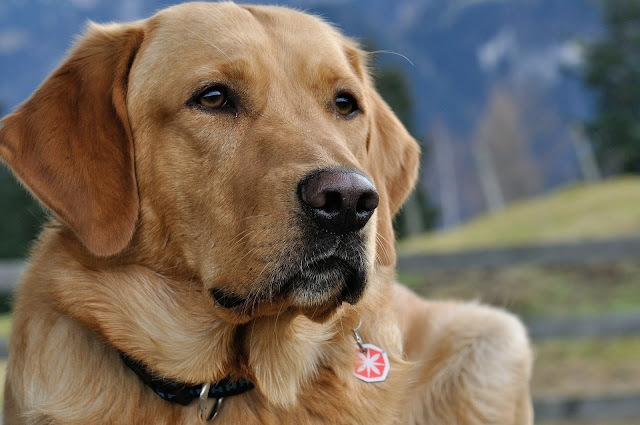 The E collar is designed to provide a snug and secure fit around the neck of dogs that will minimize the ability to reach the targeted regions including the body and the head. The hard plastic consistency will provide the greatest levels of protection for pets. Animals may experience a great deal of stress and anxiety when wearing these collars and should be managed with alternatives. The cone is designed to flare near the head of the dog to prevent the pet from being able to bite or scratch at the wound. It consists of a plastic material because it is more durable in comparison to other types of products ensuring that it will not be removed by the dog. Padding is included around the neck area that makes it more comfortable for dogs to wear. If your dog cannot get accustomed to an E collar, a neck brace is an alternative that minimizes the ability to turn the head. This will restrict pets and provide the necessary levels of protection if the cone proves too stressful for the animals. Such a brace provides a strong consistency that is most comfortable for both small and larger canines. Cones can be bought in a paper design and fitted to the shape and size requirements of the canines. Such alternatives are recommended for smaller canines because a bigger animal can roll on the material and cause damage to it. For pet owners, it is best to assess the health needs of pets and to determine the functional features that it can provide for individual needs. The supportive devices can be better accepted by pets through a process of positive reinforcement. It is important to ensure that pets are provided with the necessary support and care that will prevent against extremes of stress. The professional and experienced vet will be able to advise on the options that are available. The neck cone is one of the most important medical products to prevent animals from affecting the healing process. It includes the E collar, neck braces, and comes with a different material to prove more comfortable for the dog to wear on a daily basis. Be sure to provide the canine with a break from the collar when you are able to monitor behavior and reward positive responses. Read more about Reasons To Use Cones For Dogs. Muscular atrophy of thigh of a crossed shepherd dog with two-year-old hip dysplasia. The hip joint consists of a “ball” on the femoral bone, and a “socket” on the hip bone. Canine hip dysplasia simply defined is when a dog’s hips do not develop normally and the ball does not fit snugly into the socket. These two differing viewpoints often place the dog breeders at odds with the dog owners, causing each to blame the other for the problem. Environmental: The puppy is too heavy resulting in excessive growth and/or over or under exercising a puppy during its growth phase resulting in developmental problems. The most common theory is that hip dysplasia is indeed genetic. Most breeders have their breeding dogs’ hips rated by the Orthopedic Foundation for Animals (OFA) or Pennsylvania Hip Improvement Program (Penn-HIP), or various other international orthopedic groups. We could discuss the merits of both theories, but it doesn’t change the facts. If your dog has hip dysplasia, you need to deal with it. You may be deciding what to do next, or you may have already decided, and want to know what to expect. When Does a Dog Get Hip Dysplasia? If you subscribe to the theory that it is genetic, they are born with it. Dogs that have severe hip dysplasia often begin to have problems as puppies. Sometimes, the hip dysplasia does not cause pain for the dog, so they do not show signs of it until they develop arthritis in their hip joints. Some dogs that are not as severe can live out their entire lives with few if any symptoms. What are the Symptoms of Hip Dysplasia? There are a number of symptoms of hip dysplasia. Some dog owners only say that their dog didn’t walk right. Others will say they saw no symptoms at all, or just that their dog began to limp. Following is a list of common symptoms, of which your dog may have a couple and not have hip dysplasia. Bunny Hopping: The dog tends to use both hind legs together, rather than one at a time. This occurs when the dog is running, or going upstairs. Side Sit: Also called lazy sit, slouch or frog sit. When the dog sits, its legs are not positioned bent and close to the body. They can be loose and off to one side, or one or both legs may be straight out in front. Sway Walk: Also called a loose walk. When the dog is walking, the back end sways back and forth because the hips are loose. Limping: The dog may favor one hind leg or the other, and may alternate legs that it is favoring. Quiet Puppy: Puppies who are already in pain from hip dysplasia tend to be very good puppies. They do not roughhouse the way that normal puppies do. They also tend to sleep for a long time after playing or going for a walk. Some owners describe their puppy with hip dysplasia as the best puppy they’ve ever had. Dog Doesn’t Jump: Not only do they not jump on you, but they also seem to pull themselves up by their front end onto furniture as opposed to jumping up. Underdeveloped Hind Quarters and Overdeveloped Chest: This is caused by the failure to use the hind legs normally and jump. The dog also may actually be shifting weight forward. The only way to diagnose hip dysplasia is with x-rays. However, I must note here that you should treat the dog and not the x-rays. Some dogs with seemingly mild hip dysplasia are in a lot of pain, while other dogs with apparent severe hip dysplasia do not display symptoms. What Can Be Done for My Dog? If you have had x-rays taken of your dog’s hips at your regular vet, you may have been referred to an orthopedic surgeon. The surgeon is going to recommend various surgical options for your dog. I am going to give you a very brief overview of these surgeries. You will need to discuss your dog’s options with the surgeon. They will provide the details of each surgical option. Some people are able to treat their dog with nutritional supplements and avoid surgery. Ultimately, it will be your decision to determine the best treatment for your dog. Juvenile Pubic Symphysiodesis (JPS) - This surgery is performed on puppies under 20 weeks of age, generally when the puppy is neutered or spayed. It shows great promise as a preventive measure, by altering the pelvic growth. This surgery has a short recovery period but is generally done before a puppy can be diagnosed. However, once you’ve lived with hip dysplasia, it may prove to be worthwhile for a puppy considered at risk for developing hip dysplasia. Dorsal Acetabular Rim (DAR) – This surgery consists of bone grafts being taken from other areas of the pelvis to build up the rim on the hip socket (cup). The idea is for the femoral head to have a deeper socket to fit into. It's relatively new, so there is some question as to how a dog will do into old age - there aren't many older dogs that have had it done. Triple Pelvic Osteotomy (TPO) - This surgery involves cutting the bone around the hip socket and repositioning the socket for a better fit with the femoral head. The bones are plated back together so they heal in the correct alignment. This surgery is performed on young dogs before they have finished growing. Total Hip Replacement (THR) – This surgery consists of replacing the hip joint similar to a human hip replacement. A new cup is usually attached to the hip bone, and the femoral head is cut off the leg bone and an implant is inserted into the leg bone. This surgery is done on more mature dogs that have finished growing. Due to the size of the implants, this surgery is done on larger dogs. Previously, all artificial hip components were cemented in place. More recently, cementless hip replacements are being performed. Femoral Head & Neck Ostectomy (FHO) – This surgery consists of removing the femoral head of the leg bone to eliminate the pain of hip dysplasia. The dog’s body will then develop scar tissue to create an artificial hip joint. Long considered only appropriate for smaller dogs or as a salvage operation for a failed THR, it has become increasingly popular for larger dogs. Many people choose to have surgery performed on their dog only as a last resort. Some are able to manage their dog’s hip dysplasia with supplements, acupuncture, chiropractic care, exercise, and weight management. Sometimes, the puppy will show signs of pain from hip dysplasia, and once it is done growing and the muscles are fully developed, they seem to “go into remission”, developing signs of hip problems again as the dog ages. Surgical options are still available to you if the conservative path is unsuccessful. CANINE DIABETES; is Your Dog at Risk? The classic early warning signs of diabetes were all present when I brought my canine companion of twelve years into the Veterinarian's clinic. Muffy was lethargic, unsteady on her feet, drinking large amounts of water, and experiencing incontinence for the first time in her life. I knew something was seriously wrong. After blood work and a physical examination, the veterinarian said that Muffy had developed type-two canine diabetes. After a brief discussion, we decided to try and regulate her blood sugar level with diet modification and insulin twice daily. At first, it was rough going. Weekly checkups revealed Muffy's sugar levels continued to bounce from one extreme to the other. Determined not give up, I monitored her urine samples at home for sugar content and adjusted insulin injections as necessary. Gradually, we began to see improvement. After just a few months Muffy was once again her frisky self. You would never know by watching her race about that she had a serious health problem. A special diet, proper amounts of insulin and regular exercise have worked together with Muffy's routine veterinary care to turn the tide. As a result, I can look forward to many more happy years with my little dog. Wyoming veterinarian Mary Flitner, who recently moved her practice to New Mexico, received her D.V.M. degree at Colorado State University and an award for excellence in large animal surgery in 1997. Flitner states that diabetes in dogs and cats is more common than most people realize. According to Flitner, a pet's chance of developing diabetes will increase with age. "This is especially true in overweight, less active dogs." Besides weight and age, diet is another significant factor. Dogs given table scraps without discrimination are, particularly at risk. The importance of diet cannot be overemphasized, warns Flitner. "A high fiber diet, low in fat and sugar, is vital. And an annual checkup by a qualified professional is also an important part of proper pet care, as early detection of health complications increase successful management of the problem and helps prolong the quality of life for that pet." Flitner notes many pet owners mistakenly feel caring for a diabetic pet would be too difficult for them, an assumption that complicates the decision making the process at a critical time. "A diagnosis of diabetes in a family pet is hard enough to handle without misconceptions compounding the problem," said Flitner thoughtfully. For instance, a pet owner might opt to euthanize a pet diagnosed with diabetes because they feel incapable of managing the problem. However, with proper instruction and guidance, that same pet owner could gain the confidence necessary to properly follow the care plan developed by the veterinarian, and enjoy many more quality years together with their pet. "People need to know by regulating their pet's diabetes, that pet can still live to their full potential," said Flitner, acknowledging most caregivers consider their pet an important part the family and struggle to make right health care decisions for them. Flitner notes grocery store quality pet foods are not good choices for diabetic pets because of added fillers and sugars used to improve the taste. "Some grocery store brands of cat food actually have trace elements of antifreeze in them, because cats are attracted to it. These type foods often have a high content of sodium, which is also unhealthy for the pet. "A healthy well-balanced diet is important for any pet, but especially for those diagnosed with diabetes." Early warning signs that might indicate diabetes in your pet include: an unusually high consumption of water, increase in appetite, incontinence, lethargy, extreme changes in eyes (i.e. cataracts), lack of coordination, and vomiting. Caregivers who note such changes in their dog should promptly call a qualified professional because examination by a veterinarian is important and necessary for proper diagnosis. Flitner also acknowledges the temptation to remove the water bowl from the pet's reach if incontinence is a problem. "But, this is not the correct thing to do," instructs Flitner. In the case of diabetic canines, drinking large amounts of water is the dog's attempt to flush glucose out of the kidneys which have spilled over from the blood. If the glucose doesn't get flushed out, serious damage to the kidneys and other organs can develop. Kidney disease is something that no cat or dog owner would want their pet to suffer from. It is known as CIN- canine kidney failure in dogs and CRF- chronic renal failure in cats. It is more common in aging pets as compared to others. Though chronic renal failure occurs more in cats this problems has also been seen in dogs. Reasons are quite obvious, which is the usage of highly poisonous commercially packed pet food. Consumption of external toxins through these foods results in kidney failure. Besides the number of conventional medications and treatments, it is important that you pay special attention to your pet’s diet. It is recommended to give a low- sodium, low- phosphorous and low-protein diet to your dog or cat suffering from kidney failure. Studies have suggested that if you feed a diet which is low in phosphorous then it may help in slowing the development of kidney failure, as it reduces the mineral deposits in kidneys. However, low protein diets are somehow controversial as they generate less nitrogenous wastes whose high levels may result in vomiting and nausea. Though, diet for every dog or cat having a kidney disease must be customized to their particular requirements as specified by the diseases' stage along with urinalysis and blood tests results. For a lot of animals, a homemade high-quality protein diet would be healthier than a low- protein one. Dry food should be avoided for pets with this disease, especially cats considering the importance of hydration they need. Omega 3 fatty acids nutritional supplements from marine fish oil have proved to decrease this disease’s progression. Vitamin E with omega 3 oils are also recommended as they work synergistically. Vitamin C and B- complex will help refill the lost vitamins because of the failure of the kidneys for recycling and retaining these nutrients in their body. Before using any of these days, it is suggested to consult a veterinarian and be safe with medications. Ticks are not insects like fleas, but arachnids like mites, spiders, and scorpions. A tick has a one-piece body, harpoon-like barbs around its mouth to attach to a host for feeding, crablike legs and a sticky secretion to help hold itself to the host. The United States has about 200 tick species whose habitats include woods, beach grass, lawns, forests, and even in some urban areas. They have a four-stage life cycle, egg, larvae, nymphs, and adult. Depending on its species, a tick may take less than a year or up to several years to go through its four-stage life cycle. Adult females of some species lay about 100 eggs at a time. Others lay 3,000 to 6,000 eggs per batch. Of the four diseases, Lyme disease is the worst, as it can also infect humans. Studies indicate that dogs are 50 percent more susceptible to this disease than humans. Lyme disease is transmitted through the bite of the deer tick, also called the black-legged tick. Symptoms in humans include fatigue, chills and fever, headache, muscle and joint pain, swollen lymph nodes, and a red circular skin rash. In June 1992 the USDA licensed a vaccine to prevent Lyme disease in dogs. There is no vaccine for cats yet. If your dog is outside regularly, ask the veterinarian about the Lyme disease vaccine. Watch for the symptoms mentioned earlier, and if you suspect a tick-borne disease get your dog to the vet immediately. With early diagnosis, antibiotics generally work. If possible, dogs should be kept out of tick-infested areas. In areas where ticks are prevalent, yards, where dogs exercise, should be treated with appropriate chemicals to kill adult and immature ticks. Dogs should be examined frequently for the presence of ticks on their bodies. Ticks prefer sheltered locations, such as inside the ears and between the toes of the host, but a heavily infested dog may have ticks anywhere on its body. When a tick is found it should be removed immediately. The proper way to remove a tick is to use fine-point tweezers, grasping the tick as close to the skin as possible and pull gently, if the ticks mouth parts remain embedded in the animal's skin, you should try to remove them as you would a splinter. Alcohol or other disinfectants should be used on the bite site, the tweezers, and your hands if you do not wear gloves. The tick can and will survive after they are removed from the host. You should flush the tick down the toilet or drown them in a small container of alcohol. You should never squeeze a tick as it will release toxins that may contain any of the diseases discussed earlier. Hundreds of pesticides and repellants are available to control ticks on dogs and cats. Products range from oral medications that are available only from your veterinarian to collars, sprays, dips, shampoos, powders, and spot-on. The chemicals Chlorpyrifos and Amitraz are used in several types of products and are very effective against ticks. Amitraz should not be used on dogs that are sickly, pregnant, or nursing. However, no matter what type of medication you use, always check with your veterinarian first. 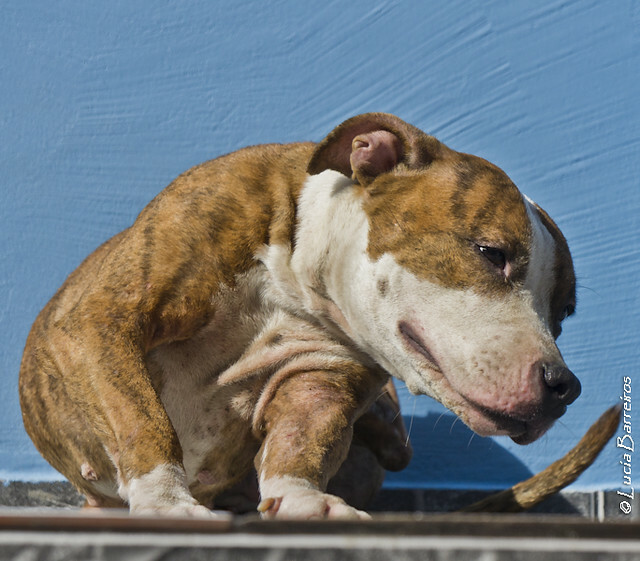 One of the most devastating parasites which may threaten your Pit Bull is the heartworm. These nasty creatures can linger in your pet for years before dealing a death blow to your Pit Bull. Heartworms are treatable, but it is best to use a protective stance rather than wait for the infection to occur. This disease is not spread from pet to pet via contact, but by another nasty creature, we all know as the mosquito. The mosquito is a necessary link in the transfer of the disease. The number of dogs infected with heartworms always increases during the height of the mosquito season. Long mosquito seasons will increase the rate of infections rapidly. Once heartworms are transmitted by the mosquito into the dog's bloodstream, they travel through the blood into the heart and the major pulmonary blood vessels. The heartworms are in the immature stage and are called microfilaria. Upon arriving in the heart, the microfilaria will set up residence and grow into adult heartworms. These fully grown parasites cause heart blockage and damage to surrounding tissues by clogging the heart and the major blood vessels leading from the heart. Adult heartworms will also interfere with the valve action within the heart. When the heart and main blood vessels get clogged, the blood flow to other critical organs is reduced, which can cause problems for the liver, kidneys, and lungs, resulting in organ failure. Most dogs which are infected with heartworms will not show any outward signs of disease for as long as up to two years. Sadly, by the time the disease starts to show signs in the dog, it is in the advanced stage. These signs depend on several factors, such as the number of adult worms and microfilariae present, as well as their location. The length of time the infection has been present, and the amount of damage already done to the heart, lungs, liver, and kidneys are all essential factors. A dry almost constant cough with labored breathing. A sudden show of nervousness or listlessness, accompanied by a loss of stamina. The signs of heartworms are most noticeable after the dog has been engaged in exercise or play. Some dogs with heartworms may even faint or drop dead suddenly right after engaging in rigorous play or exercise. Treatment for heartworms is available but it is costly and in some cases may prove fatal to the dog itself. To prevent this horrible disease in your Pit Bull, be sure to keep your dog’s regular vet appointments. Heartworms can be prevented easily by administering heartworm medication to your pet each month. As always, talk to your vet if you have any concerns that your dog may have heartworms, and never try to treat the disease on your own. Always consult a properly qualified professional before starting any type of treatments on your dog. Having a dog is a big responsibility. Some even compare taking care of a dog to that of a baby. The only advantage of having dogs compared to having babies is that they won’t grow older and turn into stressful teenagers. Because dogs are like babies they sometimes also end up in harmful situations. They would sometimes get themselves trapped in a tight place or get hit by something that will injure one of their limbs. When that happens, we should learn how to bandage our dogs to prevent further damage. Here are some basic ways of how to bandage your injured dog. 1. When your pet has a bandage, it should always be clean and dry. So it’s pretty important to make sure your pet stays inside most of the time when it has a bandage. To prevent the bandage from getting wet when the pet goes to pee or poop, a trash bag or plastic covering should cover the bandaged leg. You may use empty bread bags. When your pet has wet or dirtied up the bandage, it would require changing. Make sure to check the bandage twice a day to see if it is clean and dry. Check also for foul odors or discharge and if there is any, call your veterinarian immediately. 2. After bringing home your pet from the veterinarian make sure that the bandage is still in place. Your pet might have been irritated by it and has chewed or tried to scratch it off. Look closely at the position and the location of the bandage when you do check. Look at the toes of the pet, the bandage might have slipped up making the toes stick out. Also look at the size, if the bandage has become loose. This should be taken into account when a dog has been bandaged in the abdomen or leg area. This is because one end will be bigger than the other and eventually become narrower. When the bandage telescopes down the limb of the dog it may bunch up and abrade the limb. When that happens, the bandage should be changed as well. 3. If the dog is bandaged up in the leg make sure it isn’t too tight. Observe how the toes will appear at the bottom of the bandage at least twice a day. This is done to check for sweating, swelling, or pain. Check for skin chaffing, redness, discharge or swelling before and after the bandage has been applied. 4. To prevent the pet from chewing the bandage because of the bothersome experience it gives, put an Elizabethan collar. If you have observed that the pet is chewing or scratching it excessively, ask the vet if there might be problems. Dogs are like people in so many ways: they need to be touched, loved, and appreciated; they need exercise, proper nutrition, and good care; and sometimes they get the same diseases, like arthritis. It's been found that one of the best treatments for humans suffering from arthritis and other joint diseases is water aerobics, a form of hydrotherapy. It should be no surprise that dogs benefit similarly from the support and warmth of hydrotherapeutic pools, especially since most dogs enjoy water so much anyway. While a few years ago canine hydrotherapy was looked upon as a little odd, to say the least, today canine hydrotherapy facilities are growing much more common. Veterinarians are as likely today to prescribe canine hydrotherapy for hip dysplasia and other canine joint problems as they are to prescribe medications. Canine hydrotherapy is very simple. Special pools with powerful jets are provided for the dogs. The Jets are set up so that the dog can swim against a current, building its muscles and strengthening the ligaments around weak or damaged joints. Generally, the canine hydrotherapist enters the water with the dog, helping guide him into exercising the right parts of his body, calming him and remaining close by in case the dog grows distressed. This sort of exercise is called isokinetic – it isolates particular muscular movements to help retrain weak muscles. The number of treatments needed depends on the dog and the problem. If the hydrotherapy is recommended for a short-term condition, like rebuilding strength or recovering from surgery, it can be as few as three sessions. For a dog with a chronic illness, the hydrotherapy may be long-term or even ongoing for the rest of his life. The canine hydrotherapy pool should be warm but not hot; ideally, somewhere around 92 degrees is best. Therapists should work closely with your dog's veterinarian so they know what to treat for your pet. An individual plan should be developed for your dog intended to optimize wellness, with consideration given to muscle development, conditioning, general fitness, and relaxation. Common reasons for the use of canine hydrotherapy include pre or post-surgical conditioning; dysplasia or arthritis; obesity; cardiovascular workouts for older dogs; stroke reconditioning; and pain management, usually secondary to a joint disease. In Britain, the Canine Hydrotherapy Association was formed in 2000. They maintain standards and further the knowledge and use of good practice in hydrotherapy. Not every hydrotherapist is a member. You can also find a good canine hydrotherapist by asking about the experience the therapist has had with dogs. Have they bred or shown dogs? Run kennels? Did they ever work in a veterinary capacity? Canine hydrotherapy is a new-enough industry that there are no schools or degrees. Your best bet: let your dog choose. If the dog likes the therapist, if he's willing to work with the therapist and cooperates in his treatment, then you have a good canine hydrotherapist for your dog. At some stage of your pet's lifespan every pet owner will have to deal with the problem of fleas, ticks and mites. If left untreated they can take over your pet's skin and coat so it is really important to keep it under control. It's best to stop the problem before it gets out of control. Rather treat your pet for a few fleas than treat the whole house for an infestation! There are some misconceptions about fleas. It is not something that only happens to dirty animals! In fact it is probably more common in clean animals because fleas prefer a clean coat. Coming into contact with other animals also causes exposure to the problem and can start a flea problem in your home. Fleas, mites and ticks are parasites with a short lifespan so they reproduce quickly. Female fleas can lay up to 25 eggs a day. So you can see just how quickly the problem can get out of hand! They tend to prefer warm conditions so summer and spring are the most troublesome times for pets and owners. The main thing is that you want to catch the problem early! This means brushing your dog often and inspecting their coat. Fleas, ticks and mites are tiny black, brown crawling creatures that can even look like dirt. It may help for you to examine the fur under their ears and arms/legs. Fleas like warm places. You can also sea flea egg sacks and flea droppings in their fur if you look closely. If you still cannot see the fleas try combing your dog on a bright surface, something like a piece of paper should work well. This is a problem that needs to be treated right away. Instead of heading for the pet store to buy expensive over-the-counter treatments, sprays or dips you should rather seek professional help right away. It will save you time. Your vet should have some pamphlets or handouts about flea control. Some vets even prescribe oral treatments if the problem is out severe. If you choose to shop for the products yourself you will need to read the labels carefully to check that you are not inadvertently poisoning your pet! Never allow your pet to ingest any of the products you use; they are highly poisonous. It's also important to protect their eyes from these harsh chemicals. There is a lot of disagreement about whether or not flea collars work. They tend to kill fleas in a localized area around the collar. It is important to treat your home for fleas as well. Fleas can survive in almost anything in your home-furniture, rugs and bedding. Any flea treatments will be pointless if the flea's eggs or fleas themselves remain in your living space. To clean your home properly you will need to sanitize and clean the areas where the pet sleeps. Depending on the severity of the problem you may need to throw away blankets that have become infested with eggs. Often - just washing the affected bedding in hot water and some flea shampoo should do the trick. Rather safe than sorry though - if in doubt toss the bedding. Having to have your home fumigated will cost a lot more! Fleas can become a nightmare for any pet owner. Rather stop the problem early - check your pet everyday for fleas and regularly use a preventative product approved by your vet. Dog's ears are not something that you look at regularly. However, in addition to your dog needing regular baths, they will also need to have their ears cleaned out on a fairly regular basis. When you clean out their ears on a regular basis, it is going to be easy for you to reduce the chance of them having any type of infection in their ears. Selection of the proper cleaner is going to be what you have to do first. When you select the cleaner, you will want to make sure it is fairly neutral and not harsh for the ears. However, you will want to make sure you are looking at your dog's needs and make sure the cleaner is going to take care of the issues that your dog is having. The best source for a cleaner will be from your vet. They sell or can recommend a good safe cleaner. After the proper cleaner has been selected, you will want to keep it at room temperature. You will then take and spray the cleaner into the dog's ears. This is going to allow you to clean the dog's ears, but it is important for you to keep a paper towel or other type of towel under the dog's ears to ensure that you are not dribbling the water on the floor. When this is done, you will want to take a washcloth or something else and try to dab the ears dry. By dabbing it dry you will prevent the dog from getting any type of recurring water in their ears. Cleaning your dog's ears is going to help the dog feel better, and also get the gunk out of their ears. Most people know they have to give their dogs a bath, however, they normally do not realize they have to wash their ears as well. The problem is this is not something people tend to learn about and is not even really talked about. However, by learning how to clean your dog's ears properly, it is going to be easy for you to maintain your dog's ears and know they will be healthy for a longer period of time. How often should the ears be cleaned? That is a good question and is something you should ask your vet. Some dogs require ear cleaning more often than others. A vital part of good prevention is to know the common types of illnesses and disorders associated with particular dog breeds. For dogs, the parts of their body that are most frequently affected by congenital problems are the central nervous system, the eyes, the muscles, and the bones. For instance, the Beagle, Collie, miniature Poodle, German Shepherd, and Keeshond are more likely to inherit epilepsy. Different types of nervous system disorders are often passed on within certain breeds. Examples are paralysis of the front and back legs, which is common in the Irish Setter, a failure of muscle coordination common in Fox Terrier, and abnormal swelling of the brain is common in the Chihuahua, English Bulldog, and Cocker Spaniel. A great number of common breeds suffer from congenital eye abnormalities including glaucoma, cataracts, and blindness. Breeds such as Basenji, Basset Hound, Pekingese, Lhasa Apso, and Cairn Terrier have a high risk for inguinal hernias (gut protrudes into the groin). Umbilical hernias (gut protrudes through the navel) are inherited defects in breeds like Bull Terrier, Cocker Spaniel, Pekingese, Basenji, Collie, Weimaraner, Airedale Terrier, and Pointer. In order to keep health problems in your dog from getting serious, you need to detect them early. Therefore, it is necessary to give your dog a basic check-up about once a week. This check-up takes no more than a few minutes, and it can help prevent problems as well as expenses down the road. Start with a body rub. This makes your pet comfortable. While giving him his rub, check for any signs of flaking or scabs which can be a sign of parasites, a skin disorder, or allergies. Also, check for any lumps and bumps. Although they are a normal part of aging in dogs, they can also be a symptom that there is something wrong. Check for any swelling that could indicate parasites, heart trouble, or cancer. His breathing should be smooth and quiet unless he is panting. If his breathing is raspy or rattling, he could have a respiratory problem. Your dog's heartbeat should be regular and strong. To check for his pulse, place your hand against his chest by his left elbow. Count the number of beats in 15 seconds and multiply it by four. The rate should range between 60 and 160.